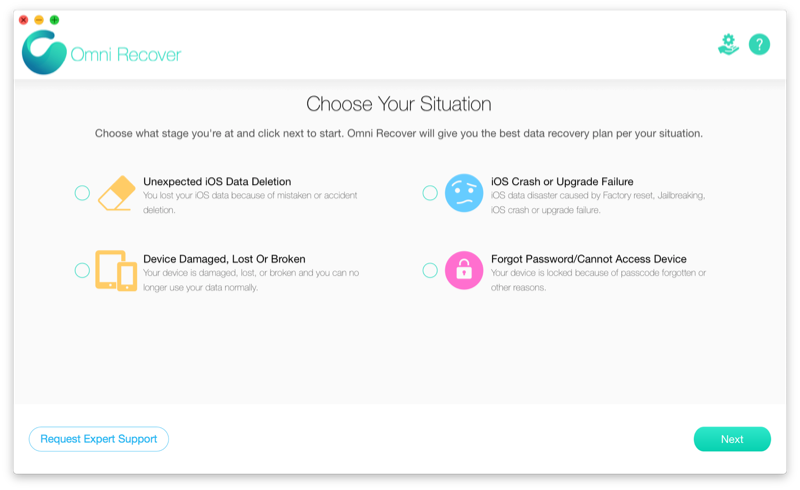 If you are looking for the best iPhone/iTunes Backup Extractor software to retrieve your deleted messages, photos, contacts and other crucial iOS data, Omni Recover is your answer. Smartphones have brought out a massive change in our lives. It plays a vital role in this regard offering users a great platform for communication and access to a wide range of applications. If you're using an iPhone, imagine how many precious photos have been taken and stored on your iPhone? How many important messages, notes, contacts that you cannot afford losing anyway? How much app data, settings and profiles? In a word, your iPhone contains most of your personal and entertainment data that you cannot live without. That's the very reason you're having multiple iPhone backups on your computer and iCloud. Restoring an iPhone from iTunes/iCloud backup is tedious and time comsuming. But with iPhone Backup Extractor tools, you'll be able to browse and extract you data from iPhone backup without restore your device. Read on to find the top iPhone Backup Extractor Software that suits you best. Alert: Looking forward to retrieving your lost iPhone data? Don't be panic. 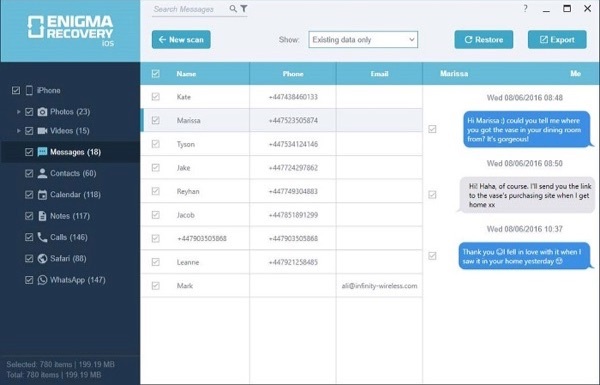 Follow this tutorial to learn Recover Deleted Text Messages on iPhone without Computer or Backup. What's iPhone Backup & What Does iPhone Backup Do? iPhone Backup is created by iTunes or iCloud (Learn What Does iCloud Backup Include), which mainly serves for two purposes. Primarily iPhone backup is for restoring iPhone content after setting up as a new iPhone. And in some cases, iPhone backup also helps to recovery iPhone data after an iOS data disaster, be it for rescuing from iOS data deletion. Although an iPhone backup almost holds everything on your device, it's a pity that neither iTunes backup nor iCloud backup allows viewing in Finder or Windows File Explorer. That's the way iPhone Backup Extractor comes in. It locates/downloads your iTunes / iCloud backup folders, reads the Info.plist and Manifest.plist files (a list of playlist files backed up by iTunes along with info like their digital signature, size, permissions and so forth) so as to let you extract files based on a variety of file types. 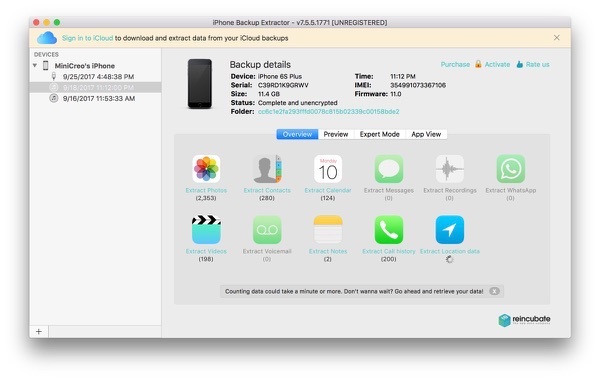 Both free and paid iPhone Backup Extractor software are available to help explore your iPhone content via iTunes/iCloud backup. But paid solutions always provide more features and better customer support service. Each iPhone Backup Extractor software in our list has particular features for viewing your iPhone backup content. Some outstanding iPhone Backup Extractor ones include encrypted iTunes Backup Extractor, sending recovered iPhone backup files back to device, saving messages, notes, contacts and other personal information in multiple file formats, etc. 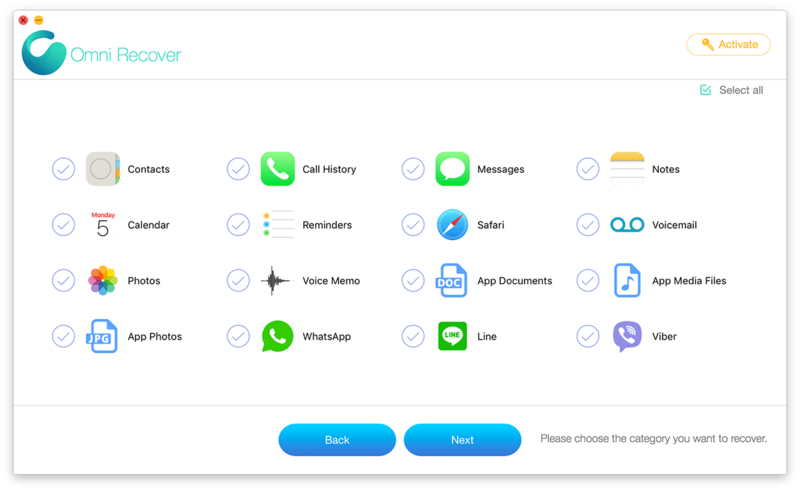 Based on our tests, iPhone Backup Extractor (a Reincubate product) is definitely top-class iPhone Backup Extractor software that gives you a variety of features. Priced at $69.95, the Premium version of iPhone Backup Extractor allows you fully explore iTunes/iCloud backup, extract useful content efficiently, and best of all, 12 months customer support gives great confidence in rescuing your iPhone backup data. Full iTunes/iCloud backup support, including the latest iOS 11. Full encrypted iTunes backups support (password required). Presented by WideAngle Software, iBackup Extractor can find all your iPhone, iPod Touch and iPad backups on your computer and lets you recover your files with ease (Learn How To Retrieve My Deleted Text Messages on iPhone). iTunes created backups of your iOS device data when you last synced your device. With iBackup Extractor, you can view the content of these backups and copy individual items from the backup to your computer. 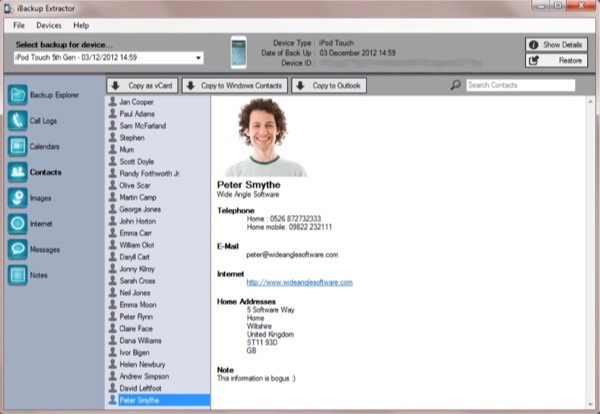 Support export contacts from iPhone backup to Windows Contacts and Outlook. Limited features and lack of design. No support for iCloud backup. Fancy but useful tool kits. 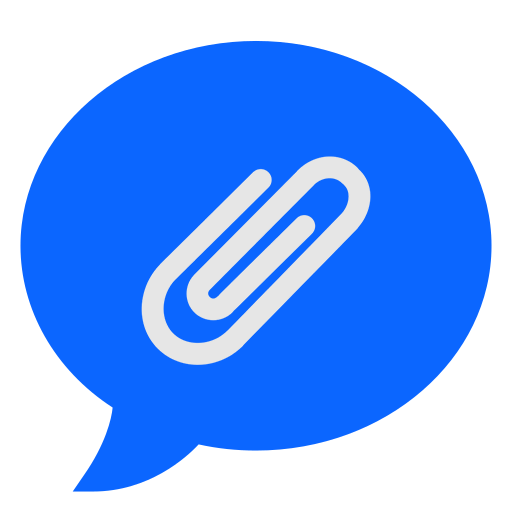 iPhone transfer, messages export and other powerful features. Features in free version are limited. Not support iCloud backup extractor (Learn How To Retrieve Deleted Text Messages from iCloud Backup). Support versatile output formats, like XML, CSV, XLS, PDF. Easily browse and extract iPhone data from iTunes backup and iCloud backup. Have Similar Suggestions? 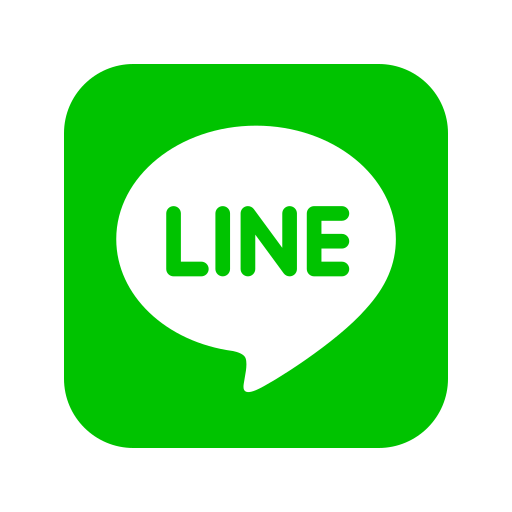 Drop A Line to Us. Do you have similar solutions regarding iPhone Backup Extractor? If yes, feel free to leave a comment and we are happy to cover it. To maximally increase your success rate of recovering lost / deleted iPhone content, here are a bunch of useful tips covering retrieval of your iPhone messages, photos, contacts and more.